Don: Tell me about the book. 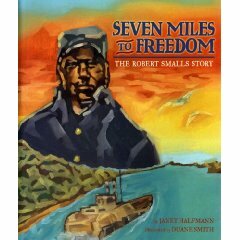 Duane: Seven Miles to Freedom is the story about Robert Smalls: an African-American slave turned soldier and steam-pilot who helps his family and friends escape from the south to the north on his steamboat. Don: How did you come to be a part of this project? Duane: I became apart of this project through an editor at Lee and Low Books, Momo Sanya, and my agent, Nicole, at Tugeau 2. Momo had a great wealth of information to share about the project and the history of Robert Smalls. Don: What did you like most about the story/manuscript? Duane: It was pretty much straight forward and well written. The author, Janet Halfmann, did a lot of research. As an Illustrator my job is to interpret the writer’s words. Each paragraph of the manuscript made me want to read more. The writing style is historical and captivating. It made me want to turn the page. Real edge of your seat reading with history, adventure and inspiration. Don: What do you feel your art brings to the story? story is historical and most illustrations seen with historical picture books are tightly rendered. With this book I wanted to try something different and almost go the opposite direction we’re use to seeing. I wanted to describe the efforts of Robert Small using bold, colorful and board strokes. My goal was to bring a conceptual thought process to story. Don: I can definitely relate. When I got into this business in the mid 90s, that was my thing, too. I wanted to be different. It seemed to me that African American children’s literature all looked the same — realistic portraiture. In fact, editors and agents at the time warned me to develop a realistic style if I wanted to get work. I’m glad that’s all changed. African American children’s literature styles now run the gamut. And I commend you for adding to the ever-growing diversity of styles. Don: What kind of research went in to preparing for this project? Duane: All of the of the literary research was done by Janet Halfmann. Being the illustrator most of my research was done through images from books based on that era, the pictorial archives at the New York Public Library, and some research was done online through the Library of Congress. Don: What medium do you use, and can you detail your illustration process. Duane: I usually use oil on watercolor paper. I really like the way it feels on the paper once the paper is sealed. I begin by covering the paper with gesso and then drawing my image. I seal it with matte meduim and begin painting with washes. building layer by layer. Don: What were your favorite illustrated children’s books as a child? Duane: I was really into the educational books like Encyclopedia Brown, books about pioneers and Abraham Lincoln. I remember getting those books when I was young. I was always flipping through the pages. Don: Who are your modern-day illustration heroes? Duane: Actually most of my heroes were my professors. They had a huge impact on my illustration style which in really cool. You start out wanting to paint like your mentor then you discover other artists on your own. I tend to really study old school painters and fine artists. Jerry Pinkney is a legend. James Ransome is a mentor and friend who’s taught me a lot. As well as Rudy Gutierrez and Steve Brodner. An array of very unique and classic styles. In which I’ve learned from all. Don: What is on the horizon for you? Duane: I would really like to illustrate more books and paint a few more murals. I enjoy teaching young people. I also enjoy graphic design. I like to pass on to others what’s been passed on to me. Don: Now for an off-the-wall question. While painting in your studio, what do you like to snack on? Duane: I really like sour cream cheddar potatoe chips with the ruffles and a coke with ice. That makes my day. Don: All that an and iPod, too! Yes, I agree, that sounds good. Thanks for your time.